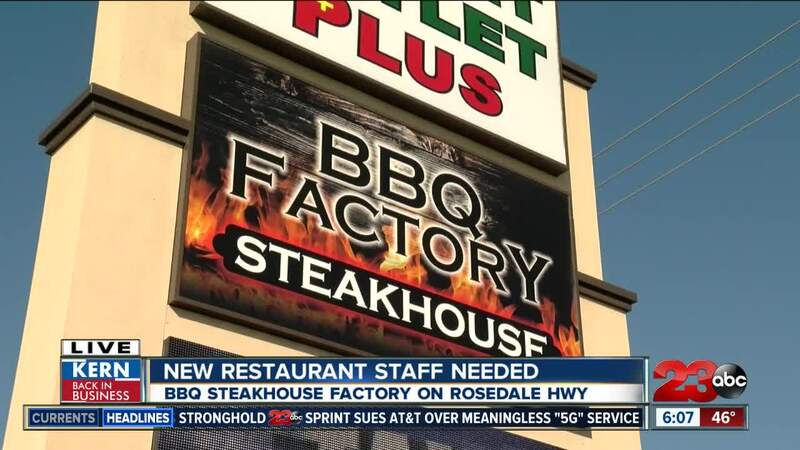 BBQ Factory Steakhouse plans to open at the end of February off Rosedale Hwy. Before then they're looking to hire all staff positions to serve their future guests. BAKERSFIELD, Calif. — A new BBQ steakhouse is getting ready to fire up its grills and open its doors to serve Bakersfield. The BBQ Factory Steakhouse is moving into a newly renovated restaurant, rebuilt from the ground up. The new restaurants specialty will be high-quality BBQ steaks on an oak wood fire. And it'll be themed with Kern County in mind. Fred Allison is the owner of BBQ Factory Steakhouse. He said, "We have an ag room an oil room, the Kern River. We'll have wildflower, everything that you can think of. Downtown events as far as the Padre and things like that. Even Rabobank. We have pictures of all of that. We're just trying to make it Bakersfield friendly." The BBQ Factory Steakhouse will have full service dinning complete with full bar and banquet room. They also plan on doing catering. And to serve all their future guests the BBQ Factory Steakhouse will need a whole new staff. "We're starting to hire next week," said Alison. "We're looking for employees for all positions, hostess, waitress, buspeople, cooks, dishwashers, you name it, bartenders, everything." BBQ Factor Steakhouse is located on Rosedale Hwy next to Carpet Outlet Plus and across the street from the Hooters shopping center. To apply for a job take your resume to BBQ Factory Steakhouse on Tuesday February 12th from 10 a.m. to 2 p.m.